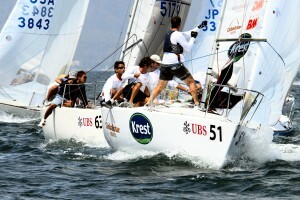 Brazil’s Mauricio Santa Cruz and his team on Bruschetta are the 2007 J/24 World Champions. The victorious Bruschetta led the boat parade through Nuevo Vallarta Harbour to cheers and horns on the final day of racing in the Mexican resort. The sky lit up with fireworks as Governor Ney Gonzales declared the J/24 UBS World Championship Vallarta officially open in front of a crowd of hundreds of international sailors, committee members, staff and volunteers in Nuevo Vallarta. Speeches were short, but the well-wishing was huge. It was clearly an emotional moment for Committee Chairman Peter Wiegandt who acknowledged the enormous effort and reward associated with bringing this event to Mexico. 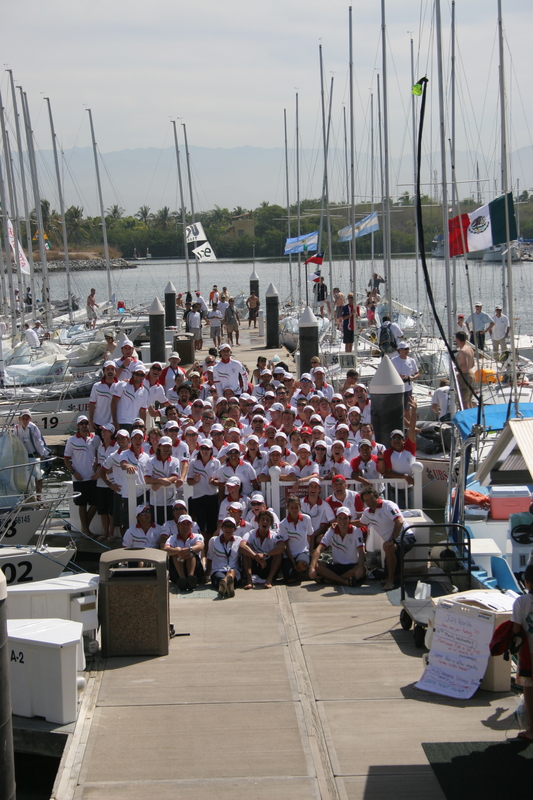 Mexican Sailing Federation President Ralph Nelles declared that Banderas Bay was the “perfect place in Mexico for this event to take place,” and thanked the State of Nayarit for their support and participation. Governor Ney, who had spent the afternoon on the water watching the practice races, declared that J/24 sailing is a perfect model for global harmony; on each boat, everyone has a duty and does it well, but is willing to help when help is needed. 2006 World Champion Maurico Santa Cruz from Brazil sat comfortably on top of the standings after the first day of racing at the 2007 J/24 World Championship. After two races, Santa Cruz, sailing Bruschetta, had finishes of 3-3 to end the day three points ahead of Rochester, New York’s Mike Ingham and Brain Cramp (7-2). Tuesday was a day of big shifts, however, nothing change at the top of the results, as Santa Cruz held onto first place. Santa Cruz and his team sailing Bruschetta scored a bullet in Race 4. He was pursued by USA’s Chris Snow on Bogus finishing second, and Canadian Rossi Milev sailing ING DIRECT in third. Just moments before the first start of the day, the wind shifted almost 40 degrees sending the RC into postponement while the course was reset. The delay gave time for the breeze to build to 18 knots. Wataru Sakamoto of Japan sailed Siesta to a first place finish in Race 3, trading the lead with Reloaded from Chile, helmed by Per von Appen, and chased closely by Juan Ignacio Grimaldi and Domingo Contessi driving Argentina’s Tag Heuer. After four races, the Brazilian boat Bruschetta was still being chased by three American teams of Snow (8-4-5-2) and Cox (4-6-4-18), with Ingham (7-2-16-11) tied for fourth with Argentinian entry Tag Heuer driven by Grimaldi/Contessi (16-5-3-12). Mexico’s Kenneth Porter (5-9-18-25) on S sits in 12th place as the top boat from the host country. Numerous protests kept the Jury busy well into the night, delaying the posting of the overall standings. Contestants are experiencing the finest of Mexican hospitality, with the UBS bash at Maxim’s favorite jet-set sandbox, Nikki Beach, on Monday night, and Tuesday night’s Paradise Beach volleyball tourney. The first race started with light air and flat seas. Great Britain’s Imarsat Hedgehog helmed by 2006 J/24 European Champion Ian Southworth and Chris McLaughlin took a strong early lead and held it to the finish, followed by Chris Snow on Bogus, and Argentina’s Tag Heuer in third place. The big wind shifts of Day Two repeated themselves as the wind clocked south just before the start of the second race. The Race Committee reset the course quickly, and the fleet had one of the best starts of the regatta, with only 3 boats over the line early. 18-knot winds forced the quickest boats on the first windward leg to change to small jib, but by the turn, the big sails were up again. In oscillating winds, Mauricio Santa Cruz on Bruschetta and Chris Snow battled for position, while Canadian John Polglase on Fragata sailed to a first place finish. The mid-way point through the 2007 World Championship had Brazil’s Mauricio Santa Cruz and his Bruschetta team firmly in first place, with Chris Snow’s Bogus from the USA right at his heels. The U.S. continued to hold onto 3 of the top 5 spots, with Mark Hillman on WIP and Mike Ingham’s Brain Cramp claiming third and fourth place. Argentina’s Tag Heuer, driven by the Grimaldi/Contessi team dropped are in fifth position. Off the water, the Sponsor Village continued to be the post-race Happy Hour spot – top-notch local restaurants have been offering gourmet specialties and the cerveza has been very, very cold. Wednesday’s Fiesta on the Beach featured a traditional Mexican buffet. A full day of racing at the J/24 World Championships and the top four boats of Day Three are still firmly on top of the rankings. Santa Cruz maintained his number one position despite a 13-4 finish. Bruschetta (3-3-8-1-7-7-13 -4) is still being chased by three American entries – Chris Snow and Bogus in second place (8-4-5-2-36-6-14-9), Mark Hillman’s WIP in third (18-1-25-4-2-3-9-19) and in fourth place, Mike Ingham (7-2-16-11-8-2-15-16) helming Brain Cramp. The big move came from the middle of the fleet. Great Britain’s Inmarsat Hedgehog driven by Southworth and McLaughlin (50-12-15-9-1-17-7-1) had their second bullet of the week, moving them up to fifth place, nudging Argentina’s team of Grimaldi/Contessi (16-5-3-12-25-5-2-20) on Tag Heuer into sixth. Host country Mexico had its best finish today when Julian Fernandez sailing Crocs (15-36-DQ-38-44-28-3-35) held onto third place throughout the first race of the day. He crossed the line after first place Sebago driven by Chile’s Dag von Appen (26-35-21-8-21-71-1-24) closely followed by second place finisher Tag Heuer. It was a Dark and Stormy Night in Sponsor Village when the Bermuda team was the generous hosts of their sixth annual World Championship Gosling Rum and Ginger Beer Party. The evening was highlighted by a costume competition, and the feast of giant paella. Sitting in top spot all week, Santa Cruz went into the final day needing only to hold off the three USA boats that have been chasing him since Day One. Mike Ingham’s Brain Cramp finished in second place with Mark Hillman driving WIP in third. Chris Snow on Bogus, who was in the top four most of the week, dropped to 8th place after 36-8 finishes. Santa Cruz retired after the first race, the Championship in hand after his 18th place finish. Japan’s Cerezo driven by Yasutaka Funazawa had consistent finishes and beat out Siesta helmed by Wataru Sakamoto, to finish fourth and fifth respectively. The final day of racing saw some of the best conditions of the week with 10-knot winds and mostly flat seas. USA’s Tundra Rose, helmed by Keith Whittemore, had its best finishes of the week with two bullets. 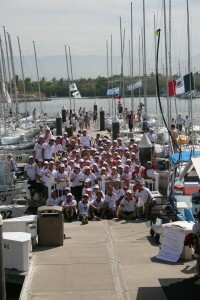 Mexico’s Yon Belauteguigoitia sailing Metiche finished as the top Mexican boat in 14th. 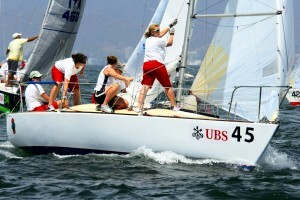 Sarah Buckley and her crew on Chile Manzano was awarded the Jaeger Trophy as the top finishing women’s team. The oldest boat racing was Tasmanian Devil owned by El Zancudo. The Dr. A. F. Turner Memorial Trophy for the top-finishing boat with a crew under 25 years was awarded to Jorge Murrieta of Mexico sailing GQ.